Native American Tribe Says Oregon Armed Occupiers Are Desecrating Sacred Land : The Two-Way The Burns Paiute tribe is demanding that the anti-federalist militants leave its ancestral lands. Paiute legend says the tribe has lived in this area since "before the Cascade Mountains were formed." Burns Paiute Tribal Chairperson Charlotte Rodrique talks to reporters about the armed occupation of the Malheur National Wildlife Refuge near Burns, Ore., on Wednesday. With the armed occupation of a federal wildlife refuge in Oregon in its fifth day, a local Native American tribe says the militants are "desecrating sacred property." Oregon Public Broadcasting's Amanda Peacher tells our Newscast unit that Burns Paiute tribal leaders denounced the militants and demanded that they leave. "The 190,000-acre wildlife refuge is within Paiute ancestral lands," Amanda says. 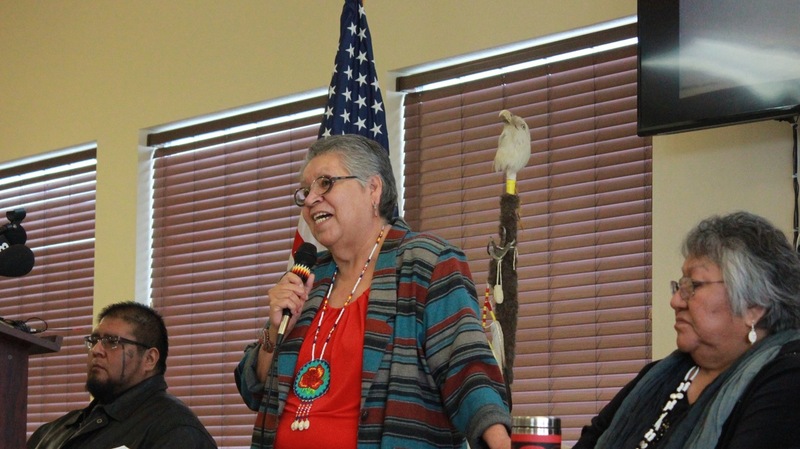 Tribal Chairperson Charlotte Rodrique says that she is "offended by occupiers' statements about returning the land to its rightful owners," Amanda reports. "You know, who are the rightful owners?" says Rodrique. "It just really rubs me the wrong way that we have a bunch of misinformed people in here — they're not the original owners." According to Paiute story and legend, the tribe has lived in this area since "before the Cascade Mountains were formed." "The tribe once occupied a large swath of land that includes the Malheur National Wildlife refuge — archaeological evidence dates back 6,000 years — but they were forced out in the late 1870s. Before settlers arrived, the tribe used it as a wintering ground, said Charlotte Rodrique, the tribal chair. "Rodrique said the tribe never ceded its rights to the land. It works with the U.S. Bureau of Land Management to preserve archaeological sites." Rodrique told Amanda that she sees "the federal refuge managers as partners in helping protect the tribe's cultural artifacts." The anti-federalist militants say they are occupying the building in support of Dwight and Steven Hammond — two ranchers who were convicted of arson on federal lands. Those ranchers have not publicly supported the takeover and turned themselves in to serve their sentences on Monday. Ryan Bundy, one of the group's leaders, had said Monday that they would leave if local residents asked them to. But on Tuesday, he reversed that stance to OPB, saying that "the purpose of this whole thing is getting people excited. And [the people in Harney County] are excited that this is taking place." Residents actually have mixed opinions about the armed occupation, as we heard on Morning Edition. The county sheriff says he will hold a community meeting to discuss the issue at 4 p.m. local time Wednesday, hoping to find a "peaceful solution."